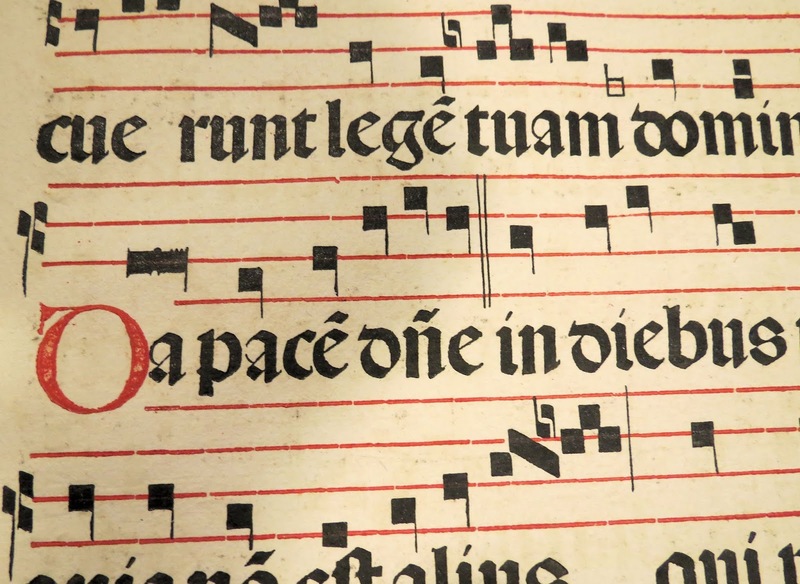 New Liturgical Movement: Why Do We Sing Liturgical Texts? In all religions of the world, we find the chanting of sacred texts. 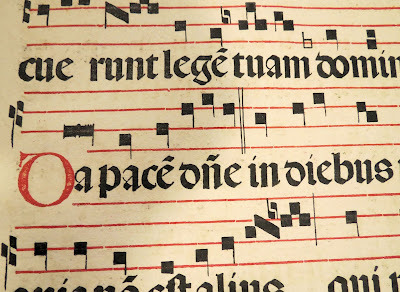 Such a surprising convergence suggests that there is a natural connection between the worship of the divine and singing the texts involved in the rites — that is, a connection based on the nature of man, of song, and of word. This universal practice derives from an intuitive sense that holy things and the holy sentiments that go along with them should not be talked about as ordinary everyday things are, but elevated to a higher level through melodious modulation—or submerged into silence. Authentic rituals, therefore, tend to alternate between silences (either for meditation or during a symbolic action) and chanting (which may or may not be accompanied by some other action). Acts of public worship are rendered more solemn, and their content more appealing and memorable, by the singing of clergy, cantors, choir, and congregation. Moreover, the contrast between singing (human expression at its highest) and silence (a deliberate “apophatic” withholding of discourse) is more striking than the contrast between speaking and not speaking. The former is like the rise and fall of ocean waves, while the latter seems more like switching a lightbulb on and off. Speech is primarily discursive and instructional, aimed at a listener, while song, which more easily and naturally unites many singers into one body, is capable of being in addition the bearer of feelings and of meanings that go beyond what words can convey, greatly augmenting the penetrating power of the words themselves. We find this especially in the melismas of chant, the lengthy melodic elaborations on a single syllable that give voice to inner emotions and aspirations that words cannot fully express. [S]inging is the natural and appropriate expression of the group, of the togetherness of individuals within the group. If this is the case, we may assume that tones — singing — essentially express not the individual but the group; more accurately, the individual in so far as he is a member, of the group; still more accurately, the individual in so far as his relation to the others is not one of “facing them” but one of togetherness. Ultimately, it comes down to this: we sing when we are at one, or wish to be at one, with our activity or the object of our activity. This is true when we are in love with another person. It is most of all true when we are in love with God. That is the origin of the incomparably great music of the Catholic tradition. St. Augustine says: “Only the lover sings.” We sing… and we whisper… and we fall silent. 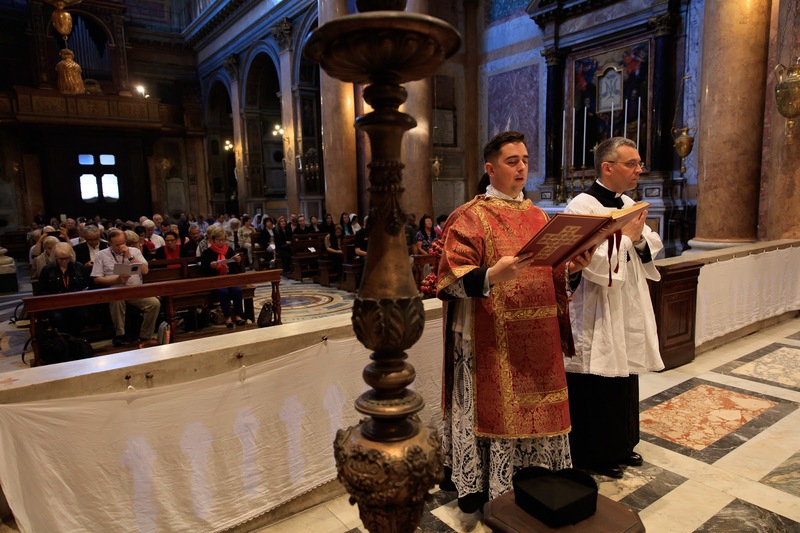 The recitation of normatively sung texts at a Low Mass “works” only because the priest alone is saying the texts, and doing so at the altar, ad orientem. He is not addressing the words of the song to anyone except God. They thereby acquire a ritual status comparable to that of the recited Canon. The speaking of sung texts is not liturgically ideal; really this form of Mass developed for the personal devotion of the priest when celebrating at a side altar with a clerk. Nevertheless, to have a large church packed with people and then to say the songs rather than sing them should strike everyone as odd. But we may leave this point aside for the nonce, as I have taken it up elsewhere. There are also practical reasons for singing. As experience proves, texts that are sung or chanted with correct elocution are heard with greater clarity and forcefulness in a large assembly of people than texts that are read aloud or even shouted. The music has a way of carrying the words and making them penetrate the listeners’ ears and souls. In ancient times, epic and lyric poetry, and even parts of political speeches, were chanted for this very reason. Electrical amplification was unnecessary when architects sought to build spaces that resonated properly and liturgical ministers learned how to sing out. A well-built church with well-trained singers has absolutely no need of artificial amplification. Moreover, not everything in the liturgy has to be heard by everyone, contrary to one of the key assumptions behind the wreckovation of our rites. It is hard to imagine a modern-day airport managing without speakers for announcements. It is, in contrast, a tragedy when the same technical, pragmatic, impersonal, and unfocused type of sound-production invades churches. In a church, the microphone kills the intimacy, humility, locality, and directionality of the human voice. The voice now becomes that of a placeless giant, a Big Brother larger than life, coming from everywhere and nowhere, dominating and subduing the listener. Putting mics and speakers in a church does not enhance a natural process; it subverts it. There is no continuum between the unaided voice and the artificially amplified voice: they are two separate phenomena, with altogether different phenomenologies. When ritual texts are adorned with fitting music, their message “carries,” both physically and spiritually. These characteristics, taken together, show that chant is not only a little bit different from other types of vocal music, but radically and profoundly different. It is liturgical music through and through, existing solely for divine worship, perfectly suited to its verbal, sacred nature, and well suited to aid the faithful who associate it with that worship and who find it both beautiful and strange, as God Himself is. We can see better now, why chant is a necessary or integral part of the solemn liturgy, why it gives a nobler form to the celebration, and why it is specially suited to the Roman Rite and deserves the foremost place within it—all of which was asserted without ambiguity in Sacrosanctum Concilium. This has come to be my principal objection to the dialogue Mass, at least inasmuch as it involves reciting those texts that would normally be sung. It’s often been remarked that the potent connection between chant and Catholicism is well exploited by Hollywood movie directors, who, whenever they want to evoke a “Catholic atmosphere,” make sure there is some chant wafting in the background. If only today’s clergy had half as much “business sense”!